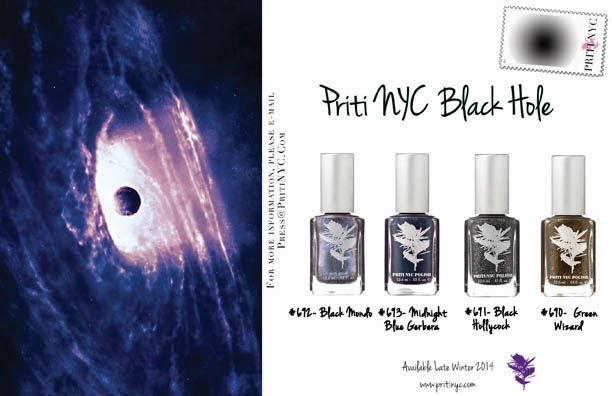 Priti NYC Black Hole collection - Polish Etc. When Priti NYC contacted me to swatch some of their polish, I was beyond excited. I have several polishes of theirs in my personal collection. I love polishes that are five free and vegan. Today I have polishes from their Black Hole Winter collection. They are gorgeous!! Hope you like them. First up, Black Mondo. A super rich medium grayish blue cream with silver shimmer. Flawless formula with easy application. Brush is a little thick, but the width is perfect. This is two coats with no top coat. Green Wizard Rudbeckia. Army green crelly with gold flaky bits and gold shimmer. Hard to capture the complexity. Formula was great. This is two coats, no top coat. Black Hollycock. This is polish is gorgeous. Definitely one of my favorites. Black jelly, filled with blue, green, silver and copper micro glitter. Gorgeous polish and flawless in three coats. Topped with one coat of HK Girl top coat. Last but not least. Midnight Blue Gerbera. This was my favorite. I didn't think this blue was going to amaze me like it did but WOW it's so pretty. This is a cobalt blue jelly filled with silver micro glitter. This is a perfect winter shade. I wish I would have had this around Christmas for the snow mani I had done.